Although our American trip was almost a year ago now, we had such a brilliant time that I still have so much to write about even so long after. I still haven’t written about all the amazing sights on our road trip through the Big Sur, I’ve not told you about everything there is to see in Vegas even if you don’t like gambling, and I’ve still not shared the details of our funky campervan adventures, so I thought it was about time the blog got back onto the USA. 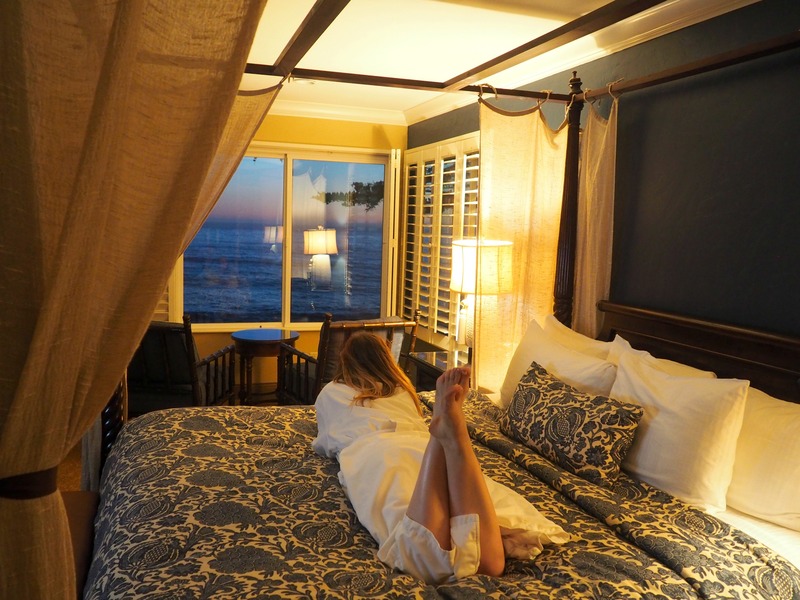 One of my favourite parts of the adventure was our road trip along the stunning Big Sur coastline so I thought I’d start off by sharing one of the best places to stay along this part of the Pacific Coast Highway. We had spent the previous night in Carmel-by-the-Sea, one of the prettiest little towns in California. There is so much to see and do through the Big Sur, from national parks and magical waterfalls to famous bridges and sandy beaches, plus more viewpoints along the coastline than I can mention in one blog post, each with a more gorgeous view than the last. We knew it was going to be a long day and wanted to take it slow so we would have time to fit everything in, so we decided to spend the next night in Cambria, a little beachfront town at the southern end of the Big Sur. 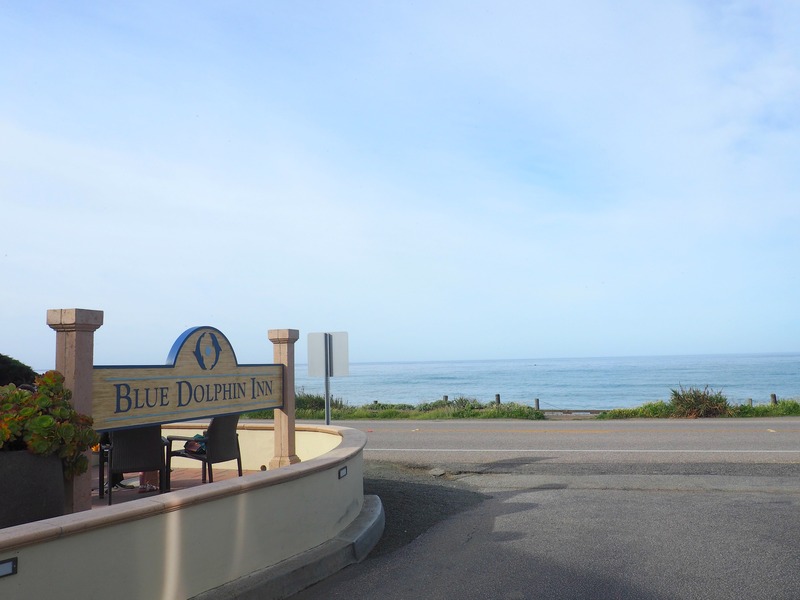 The Blue Dolphin Inn was right on the seafront broadwalk, just steps away from the sand of Moonstone Beach, and I loved the idea of going to sleep and waking up to the sound of the waves. We parked up our campervan expecting to find just a simple inn or motel for one night but were pleasantly surprised to find so much more. Inside, there was a plush and luxurious feel with splashes of beach and ocean features so we didn’t forget we were right by the coast. 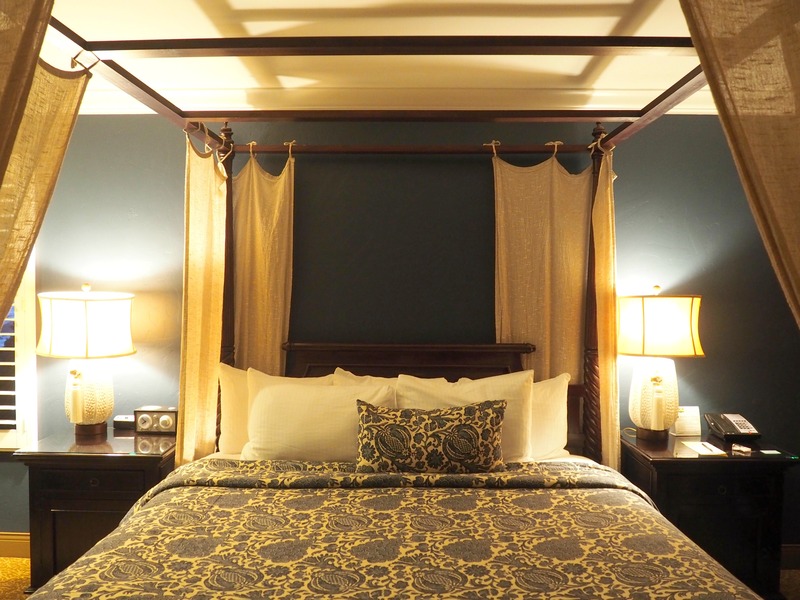 It felt so cosy and intimate and our room even more so with deep comforting sea blue and golden sandy colours and a huge four poster king size bed. We were so exhausted from the long but exciting day of driving and sightseeing down the coast that we pretty much collapsed as soon as we got into the room. 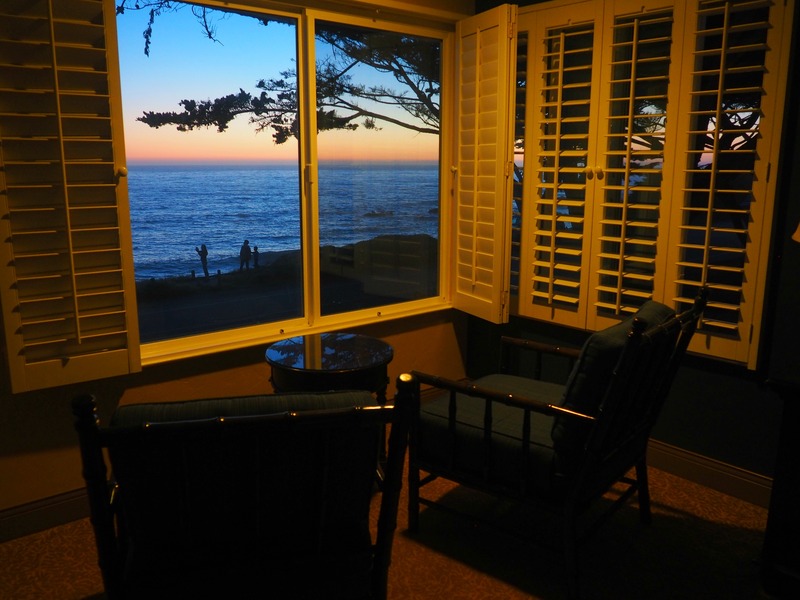 But not before we had watched one of those oh-so-colourful Californian sunsets over the ocean from the comfort of our big bed, through the large windows that looked directly out to the sea. Seeing as our dressing gowns were already on and the bed felt far too comfy to get out of, instead of going for a wander into town we grabbed some snacks from our campervan and pigged out on as many sugar-filled American foods that we could find including plenty of Reese’s Peanut Butter Cups, an XXXL bottle of Doctor Pepper and some take away cake from The Cheesecake Factory (yes, I know it seems that I can’t write a post about our time in the USA without mentioning The Cheesecake Factory and it may sound like we were always stopping there for more cake…but, in all honesty, that’s because we were). 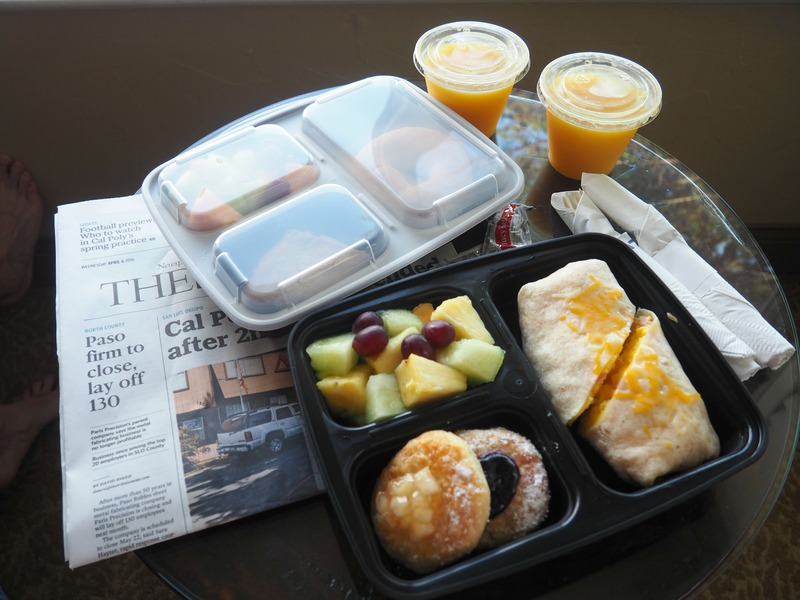 There’s no restaurant at the Inn but they deliver a picnic style breakfast to your room, so before nodding off we filled out the breakfast menu form that had been provided, ticking which options we wanted. Sure enough, the next morning we were greeted by a knock on the door at the exact time we had requested our breakfast and in came a tray full of delicious smelling goodies from fresh fruit and sugar sprinkled pastries to cream cheese filled bagels and hot egg wraps, along with some deliciously fresh OJ. 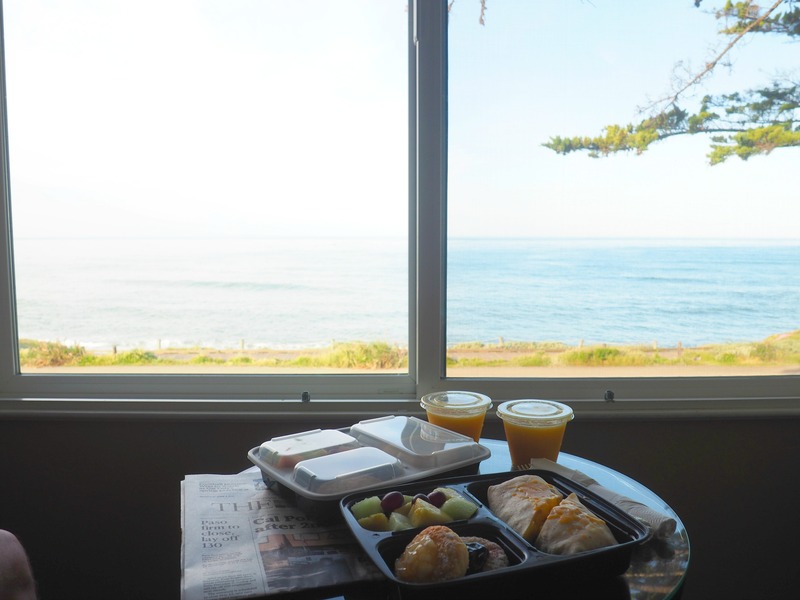 We debated taking our breakfast picnic onto the beach but the tide was quite high so instead we opened up the huge blinds to let in the streaming Californian sunshine and ate looking out at the sea, wishing we could wake up to this view every day. 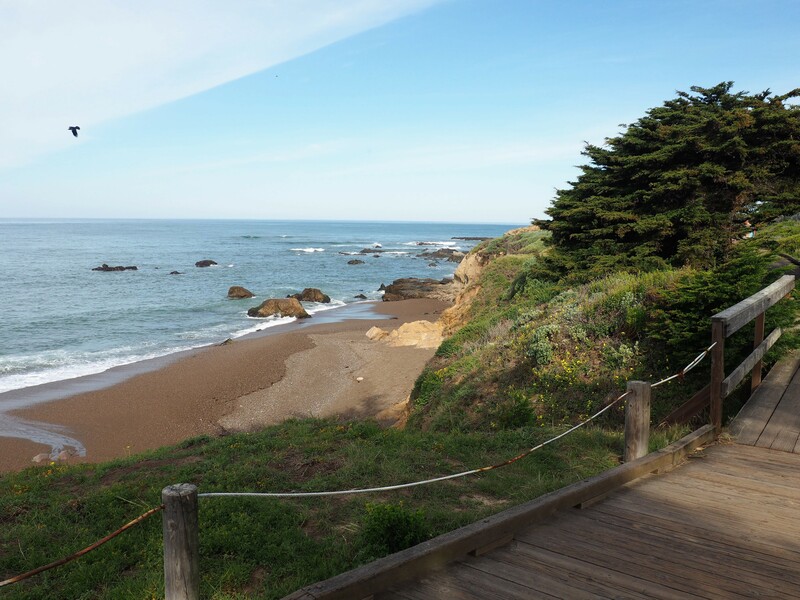 The whole atmosphere, from the Inn to the little seafront town of Cambria itself, was so calm and tranquil. We didn’t hear a peep out of any of the other guests which gave us the most blissful sleep – much needed after such a long day of exploring. Even outside the only movements were the gentle waves hitting the shore and the occasional person out for an early morning stroll. I would have been perfectly happy staying here in our own little peaceful ocean escape instead of heading further south towards the craziness of Los Angeles, but the road, and lots more adventure, awaited us. Thank you to Cambria Inns who hosted our stay at The Blue Dolphin Inn. It was the perfect end to an adventurous day exploring the Big Sur. Big Sur has got to be one of the most beautiful places that I’ve ever been! What a fabulous spot! I’d love to watch the sunset from that bed – heavenly. I cannot get over how gorgeous and colourful every sunset in California was! This made me miss California so much, gorgeous views! Ahh California – this post brings it all back! We loved driving down that gorgeous coastline to Big Sur but didn’t stay there – wish we had now!